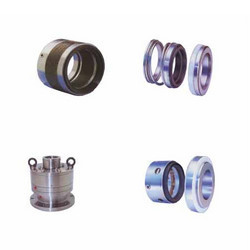 We are manufacturing all type of Mechanical Seals for Zero Leakage and Friction Power saving with clean atmosphere. We made designed as per our customer technical specification and job equipments. We have fully technical person and site service engineers. Our range of Mechanical Seals include Balance Seal, Agitator Seal, Single Spring Seal, Multi Spring Seal, Process Pump Seal, Blower Seal, Bellow Seal and Seal Spares.